Anyone from Melbourne is familiar with the concept of “four seasons in one day”. I don’t think I’ve ever experienced this phenomenon as profoundly as my second day in Alba. It was raining very lightly all afternoon the previous day, and kept raining all night. In the higher parts of the Langhe, however it snowed. 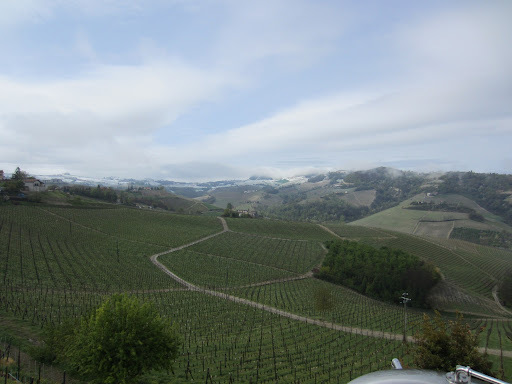 The view from my first appointment in Serralunga d’Alba was magical, as by the time I got up there it had started to clear and you could see the white-capped hills. By the time I got out from lunch, the sun was shining and it felt like Autumn, but it was still a little windy and chilly. Between my second and third appointment, it had got up past 20 degrees, and was almost feeling like Summer. Then by the time I got back to my hotel it had started to cool down to Spring conditions here in the Langhe. It makes me a little homesick, and also glad that I have a zippy little Fiat 500 to take the sharp corners in the wet. Today I ventured deeper into Alba, visiting three producers entrenched in what is considered the ‘masculine’ part of Barolo; Serralunga d’Alba, Castiglione Falletto and Monforte d’Alba. Something I missed out on back at home last year before I left was a lunch at the Melbourne Stokehouse with Massolino, pairing juicy steaks with Barolo. Fortunately I still got to taste the wines the following day at work and instantly fell in love with the range, subsequently stocking most of them. Representing the wines was Giovanni Angeli, and I was happy to discover he remembered me when I met with him at Vinitaly, in spite of the natural fatigue that comes with the fair. Located in one of the most historic parts of Barolo, the first Massolino cellars were built in the early 20th Century. Several generations later, parcels of vineyards were purchased in vineyards that would define the winery. These vineyards are Margheria, Parafada and Vigna Rionda, each with their own unique personality, style, ageing potential and expressions of vintage. The Massolino philosophy is similar to their branding; respectful of tradition but modern and innovative. A perfect example is the labels, which are both classic and clean, but include unique uses of space and dimension, coupled with clean bright black and white. Another innovation has been to visualise the unique personalities of the vineyards using characters, something first exhibited at Vinitaly. 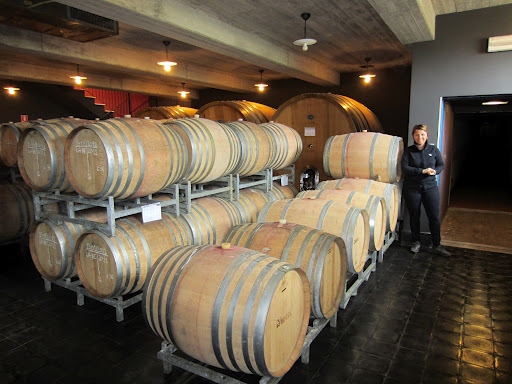 New oak is rarely used in the winery, aiming for purity, harmony and elegance in the wines. One of the really cool things they do is to hold back some of their top cru – Vigna Rionda – to be released after ten years, really showing the commitment to the vineyard and the ageing potential of Barolo. 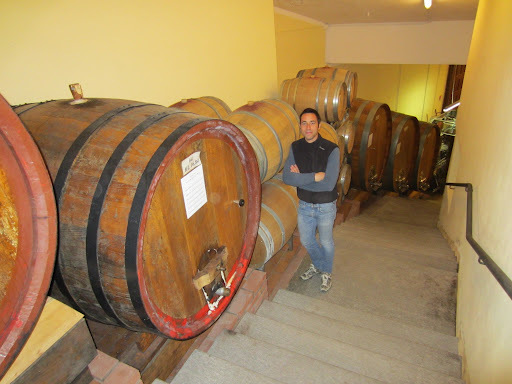 Giovanni took me through the winery, and we had a look at some Barolo wines from the large barrels. For the full tasting notes click here. Vietti is probably one of the most important wine names in Piedmont, if not Italy. Established in 1900, it has always been at the forefront of site selection, varietal integrity, innovation and marketing. 33 hectares are owned and several more leased across a number of key areas in the Langhe, with the Barolo and Barbaresco crus the top of the pile. Vietti was one of the first names I became familiar with when I first began to discover Italian wine, and were a key part of the range I stocked at King & Godfree. Although by Barolo standards they are quite large for a non-cooperative winery, their commitment to the highest quality at all levels is clear. They are greatly respected within and without the region, and are located in the gorgeous hilltop village of Castiglione Falletto. Due to restrictions of expansion up or outwards, they were forced to build down and have several levels of winery and cellar, constructed in three stages over the last century. 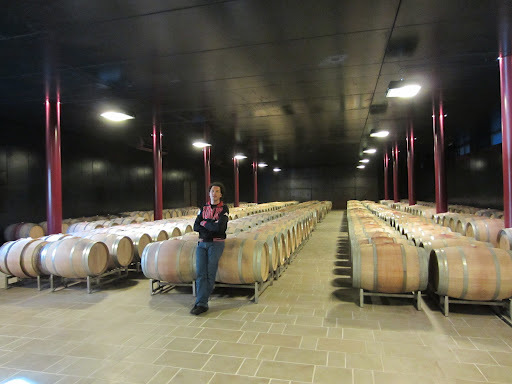 Elena Currado-Penna, wife of Luca Currado, welcomed me to the winery and introduced me to the deep and diverse range. Here are the notes from my tasting. My final appointment of the day was to a modern pioneer of the region, and one of the most humble and simple people you are likely to meet. The name Domenico Clerico carries a fair amount of weight in Barolo, more recently thanks to the high-tech and spacious cellars recently completed just outside of Monforte d’Alba. The cellars are so recent that there are no signs indicating it as the Domenico Clerico winery, which unfortunately caused me to be a little bit late to my appointment. Coming from a farming family, Domenico Clerico didn’t have much to start with apart from drive and passion. He has grown his business and his name to become one of the best known from Barolo, and has won praise from consumers and critics alike. The new cellars are part of his philosophy of looking into the future, and providing the new generations with the best knowledge and capacity to continue the legacy. The cellars reminded me of some that I had seen in South America, very intelligently designed, well organised with modern equipment designed to monitor rather than interfere. My host was Luciano Racco, a jack-of-all who spends some time in the winery and some out in the markets, but I had the briefest of opportunities to meet the man himself, who still spends most of his time out in the vineyards. Click here to read the notes from my tasting. Click here to see more photos from Day 2 in the Langhe, Italy.